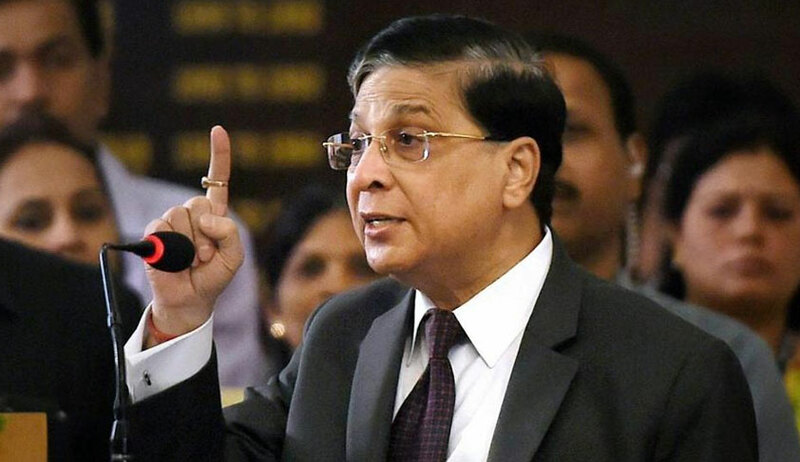 71 Rajya Sabha Members belonging to seven political parties have signed the notice for initiating impeachment proceedings against Chief Justice of India Dipak Misra, Rajya Sabha Opposition leader Mr. Ghulam Nabi Azad confirmed at a press conference today. The parties that have signed the notice include Congress, NCP, CPM, CPI, SP, BSP and Muslim League. Addressing the conference, Mr. Azad further confirmed that the motion has been delivered to Vice President of India, Mr. Venkaiah Naidu. He informed those present that the impeachment is being sought to be initiated under five listed grounds of misbehavior. Also present at the conference were Congress Leader Mr. Kapil Sibal, Senior advocate and Rajya Sabha member Mr. KTS Tulsi, CPI Leader Mr. D. Raja and Senior leader and media in charge of the Congress Randeep Singh Surjewala. ...We were hoping that the anguish of the judges would be addressed by the Chief Justice and that he would set his house in order. More than 3 months have passed, nothing has changed. The Chief Justice has not asserted the independence of the judiciary in the face of pressure by the executive." Mr. Sibal brought up the medical college bribery case as well, to assert that the first charge relates to the "conspiracy to pay illegal gratifications". He, in fact, claimed that there exist several taped conversations with the CBI, in which a retired Orissa High Court judge is talking about some deals with other people. This conversation, he said, also mentioned the CJI. The second charge, he said, related to the CJI's exercise of administrative and judicial powers. Another charge related to the Chief Justice acquiring land when he was an Advocate. He then asserted that "majesty of law is more important than the majesty of any other office", and added that the "democracy can thrive only when the judiciary stands firm and exercise its powers honestly and independently". Over the past few days, reports were rife that the Congress and the Nationalist Congress Party (NCP) led by Sharad Pawar had already signed the impeachment draft. Another report by The Economic Times had indicated that leaders of several opposition parties, including the Trinamool Congress, the NCP and the Communist Party of India (Marxist), actively discussed the matter over the past few days. The discussions were initiated soon after the unprecedented press conference held by four sitting Judges of the Supreme Court and the uproar that followed. The four Judges – Justice J. Chelameswar, Justice Ranjan Gogoi, Justice M.B. Lokur and Justice Kurian Joseph- had then asserted that the administration of the Apex Court is “not in order” and that many “things less than desirable” have been happening in the last few months. It was also revealed that they had written a letter to the CJI two months ago, airing their grievances. CJI Misra had also found himself in a soup in the medical college bribery case, which had even fuelled unprecedented drama at the Supreme Court with the Court annulling an order passed by a two-Judge Bench, after a rather forthright confrontation between the CJI and Advocate Prashant Bhushan. However, senior INC leader Mallikarjun Kharge had later confirmed that CJI Misra was off the hook and that the "issue is closed now". But the matter seems to be far from over.